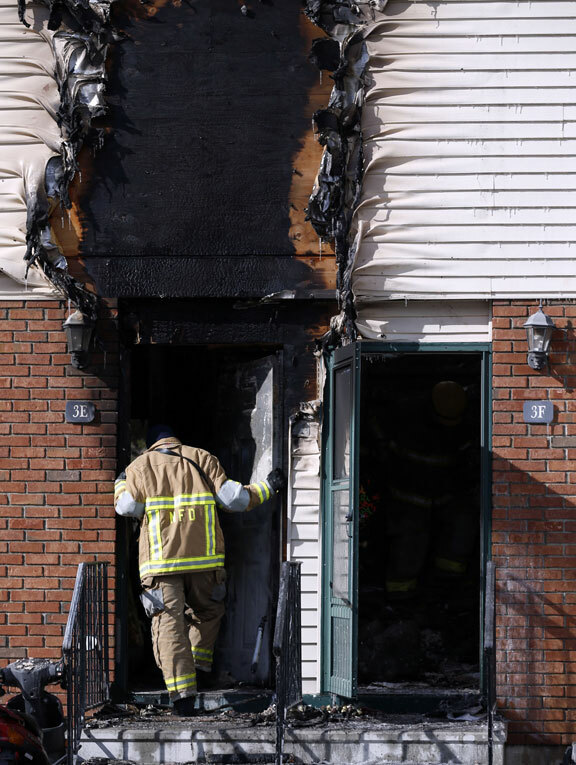 NAUGATUCK — A fast-moving fire at a condominium complex on Horton Hill Road early Saturday morning displaced 16 residents and left several injured, including firefighters. Naugatuck firefighters arrived at Meadowland Estates at 6:32 a.m. and found fire blowing out the windows and front door of Unit 3E in building three. “The whole front was fully involved and when we went around back, we found the exact same condition,” Capt. Vin Healy said. The fire, which began in the basement of the unit, shot up to the first and second floors and into the attic shared by the eight condos that comprise the building, he said. Firefighters prevented the fire from spreading in one direction through the common attic, but as it moved in the other direction toward the building’s power lines, it entered three other units, causing fire damage to their second-floor bedrooms. “Within 10 minutes of arrival, we had fire in four units,” Healy said. 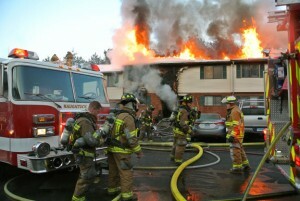 All residents had escaped from the building by the time firefighters arrived. A few Naugatuck firefighters suffered minor injuries during the fire and cleanup afterward. One fell on ice and another injured his lower back while carrying the bodies of two large dogs out of the basement of a condo unit. Another firefighter dislocated his shoulder while pulling down pieces of sheet rock; he immediately put his shoulder back in its socket and kept working, Healy said. One condo unit occupant was treated for smoke inhalation at a hospital and released, and another was treated and released for cuts he received in the fire. The overall damage to section E was serious, but firefighters said it could have been a lot worse had it not been for a quick response. Healy said five volunteers from the Beacon Hose Company No. 1 in Beacon Falls arrived on scene for mutual aid within five minutes, while career firefighters from the Waterbury Fire Department responded within seven minutes; both are incredibly fast times, he said. Healy said fire doubles its size every three to five minutes, so a quick response is crucial. All eight units would have been lost if not for the quick attack, he said. As it turns out, at least four units appear to be salvageable; the other four may be a total loss, though insurance appraisers were still investigating Sunday, officials said. Prospect and Oxford fire departments brought engines to cover Naugatuck’s fire stations, and Seymour firefighters manned a truck at Naugatuck’s fire headquarters. Also, Prospect replaced exhausted firefighters at the scene, Healy said. Diana MacKenzie woke up shortly before 6:30 a.m. to the sound of neighbors pounding on her walls. They were ready to break down her door if she didn’t answer. At that point, the fire was two units away from hers. MacKenzie, who was in her pajamas, grabbed her coat and shoes and ran outside. “We were stuck in the parking lot, just watching the flames jump across the building,” she said. She counts her blessings that her condo didn’t catch fire and hopes she’ll be able to recover some of her belongings. But she tells herself things can be replaced; people can’t. “The one thing I’m thankful for is we all made it out of the building,” MacKenzie said. Firefighters had to overcome many obstacles, along with freezing cold temperatures, while fighting the fire for two hours. Healy said fires that start in a basement are especially bad because they can continue rising up the building, whereas an attic fire only has the attic to burn. On Saturday, firefighters found it difficult to get to the source of the fire, he said, because the staircase leading to the basement was consumed by fire. The floor above the basement, the main floor, was so damaged by heat and fire that three firefighters stepped through the floor but did not fall all the way through. To get to the source of the flames, firefighters cut a hole in main floor and lowered a 14-foot ladder into the basement so they could extinguish the source of the fire, Healy said. The cause of the fire remained under investigation as of Sunday night, though fire investigators are focusing on overloaded electrical wiring in a basement as the probable cause. Acting Fire Marshal Robert Weaver said he found evidence of an electrical wiring issue in the basement of unit 3E where the fire started about 6 a.m. It appears the homeowner had a bedroom set up in the basement, he said. While the fire marshal’s office conducts a joint investigation with local building inspectors, 16 tenants who lost their homes were securing temporary living plans. Mayor’s Aide Ed Carter said the American Red Cross had placed a majority of those affected in a nearby hotel for two nights. “I told the hotel clerk to just automatically extend their stay, and we’ll deal with it when we’re back to work on Tuesday,” he said. Seven of the eight condos affected were owner-occupied, so they will have homeowner’s insurance, he said. The people who rented, he believes, sustained some of the least significant damage.